Some landscape painters make a few coastal views, others make the coast the central thread in their work. 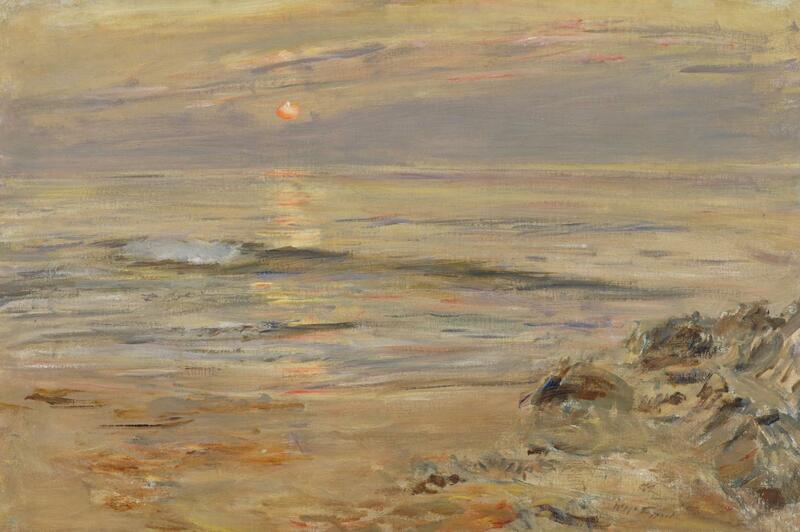 William McTaggart (1835–1910) was in the latter group, to the point where I’m sure if you looked hard enough around his favourite haunts in Kintyre, you’ll still find him there, painting briskly on another canvas. 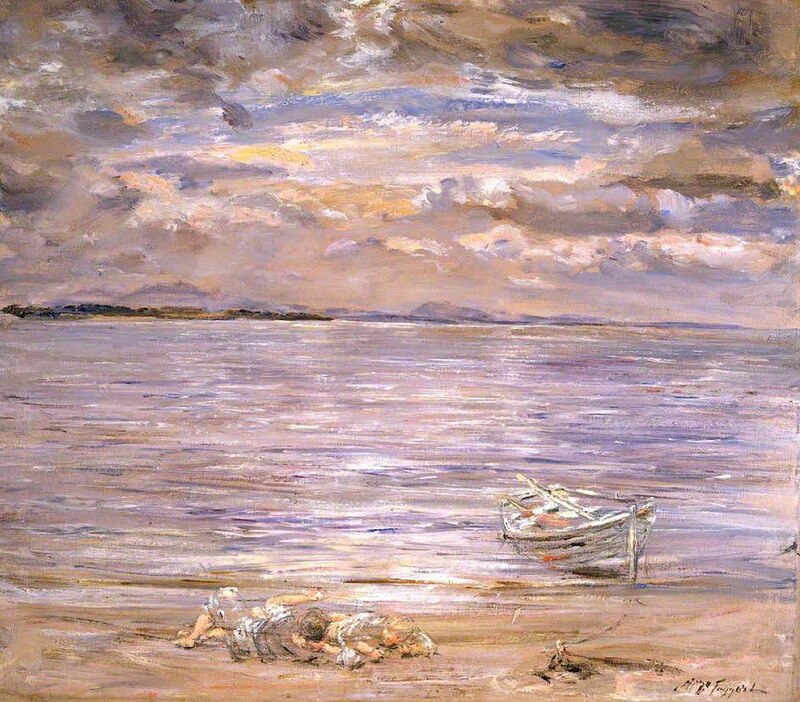 McTaggart is also unusual in having painted some of the most beautiful coastal landscapes in the world, around the west coast of Scotland. He was born into a Scottish Gaelic-speaking family of crofters, in the tiny village of Aros, on the western side of the Kintyre peninsula, which is on the west coast of Scotland. Like many of the best artists of the day, he studied at the Trustees’ Academy in Edinburgh, now the Edinburgh College of Art. He was very successful there, winning prizes, and started his career in figurative painting. 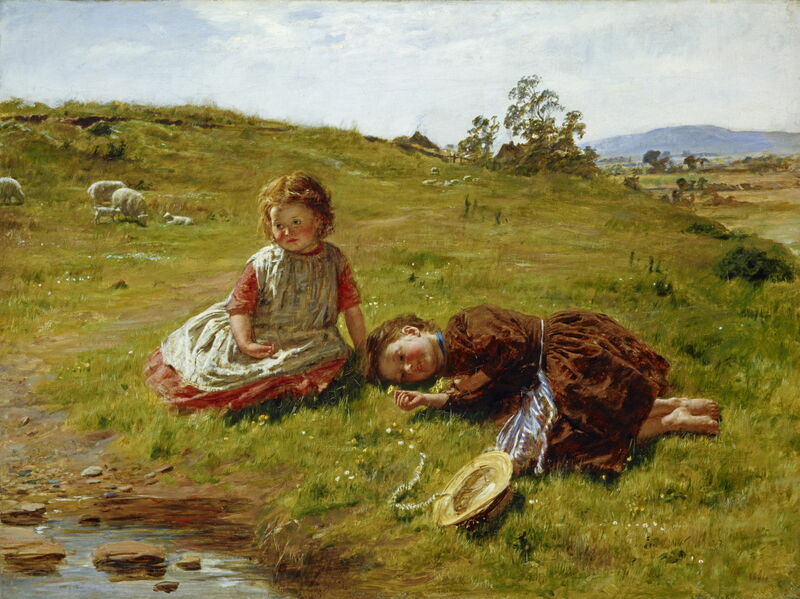 Like many of his earlier paintings, Spring (1864) features children, here two bonnie young girls resting by a stream. The young lambs in the background confirm that they are out in the Spring sunshine. This was one of a pair of paintings commissioned by a Dundee textile manufacturer, GB Simpson, in 1863, the other showing autumn. McTaggart was admitted as a full member of the Royal Scottish Academy (the Scottish sister organisation to the Royal Academy in London) in 1870. He then turned to concentrate on landscape art, in particular depicting the coast of Kintyre and other locations on the rugged west coast. 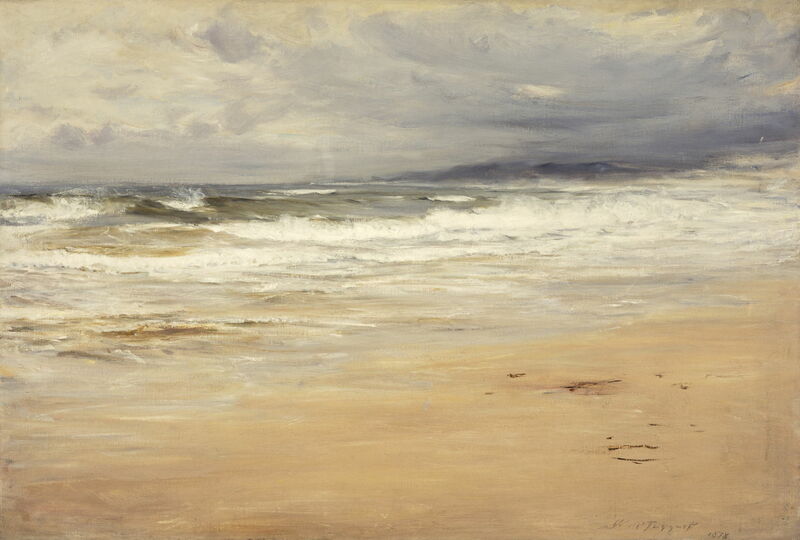 Machrihanish Bay (1878) shows one of his favourite locations (near his childhood home), on the west coast of Kintyre where it is exposed to the full might of the North Atlantic Ocean. This bay is noted for its long unbroken stretch of sand, here being pounded by a moderate sea. His brushwork is far looser than in his earlier figurative paintings, and captures the variety of surfaces and textures. During the summer, McTaggart stayed in the tiny fishing village of Machrihanish so that he could capture fleeting light conditions, as in his Summer Sundown – Tir-nan-og (1880). The name Tir-nan-og in its title refers to the legendary Celtic paradise in the west. McTaggart would of course have been aware of the French Impressionists at this time, but probably didn’t see any of their paintings until 1883. Instead, it is usually considered that he was influenced more by Whistler, the Hague School, and Joseph Israels in particular. William McTaggart (1835–1910), Sun on the Waters, Fishing from the Rocks at Carradale (1882), oil on canvas, 76 x 102 cm, Private collection. The Athenaeum. Sun on the Waters, Fishing from the Rocks at Carradale (1882) shows fine weather on the east coast of Kintyre, opposite the western coast of the Isle of Arran, which is just visible at the left edge. McTaggart often hired local children to model for his paintings, and these three appear to be taking great pleasure in their activity. 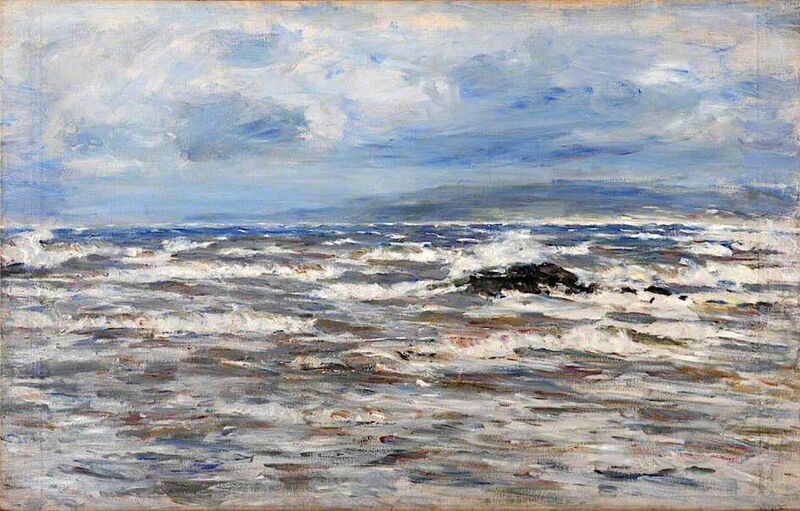 William McTaggart (1835–1910), Wind and Rain, Carradale (1883), oil on canvas, 74.9 x 106.1 cm, Dundee Art Galleries and Museums, Dundee, Scotland. The Athenaeum. Even on the more sheltered side of Kintyre, squally showers can be frequent, as shown in Wind and Rain, Carradale (1883). 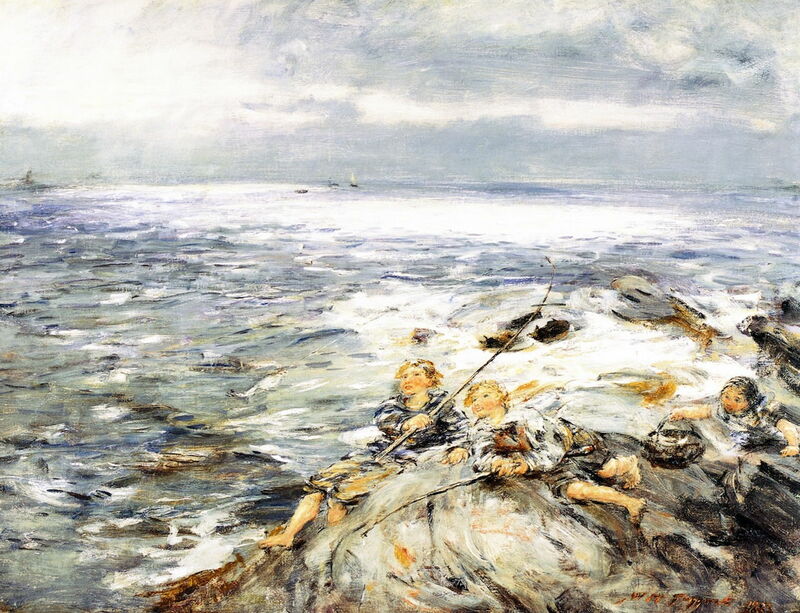 The Storm (1890) shows the same area at the height of a severe gale, figures clad in sou’westers and clinging to the rocks as land, sea and air merge into one continuum. This painting was first purchased by the Scottish-American industrialist Andrew Carnegie. Most of his larger paintings including this one were made in his studio from smaller oil sketches which he made in front of the motif, following the classic process for landscape painting. Sometimes he, and other Scottish landscape artists, did work directly en plein air on large canvases, and there are photographs showing them doggedly painting the coast with their canvas lashed to the ground to prevent it from blowing away. 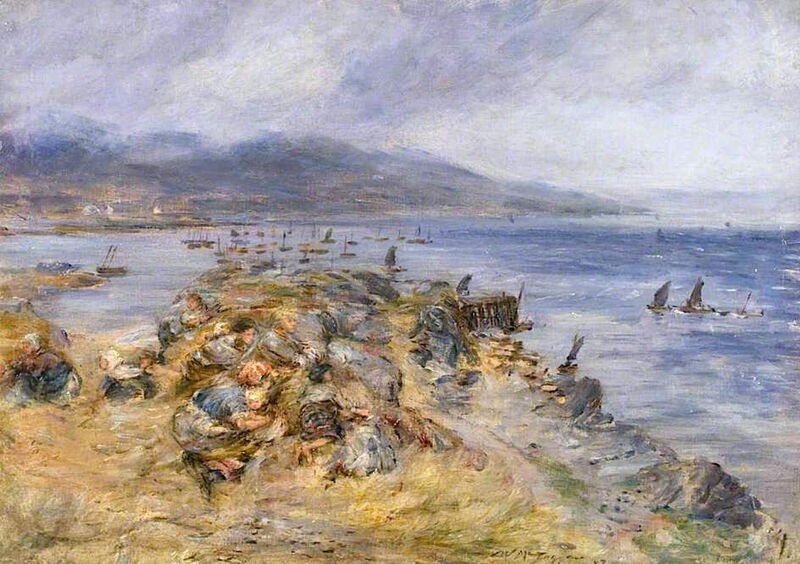 William McTaggart (1835–1910), Noontide, Jovie’s Neuk (1894), oil on canvas, 88.9 x 97.8 cm, City Art Centre, Edinburgh, Scotland. The Athenaeum. Noontide, Jovie’s Neuk (1894) is a more peaceful scene at the northern end of Aberlady Bay, a picturesque section of coastline to the east of Edinburgh. 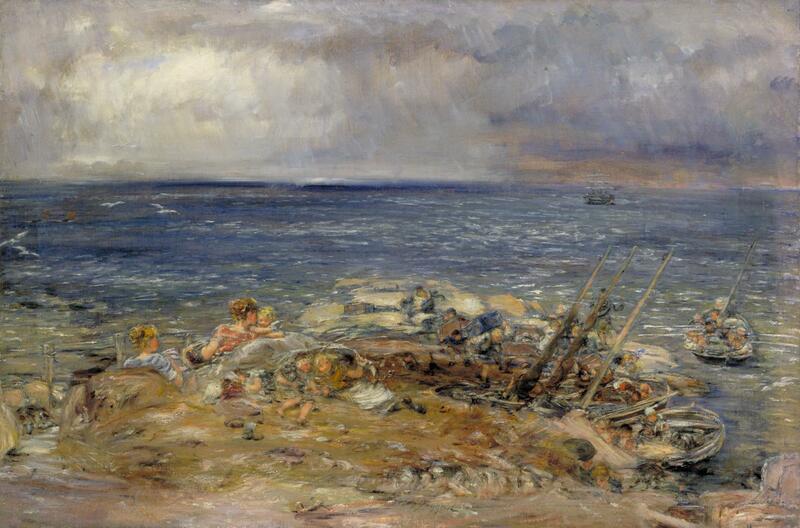 McTaggart also set historical scenes into his coastal landscapes, here The Coming of Saint Columba (1895). This Irish abbot and missionary is generally believed to have brought Christianity to Scotland around 563 CE. Although most strongly associated with the first abbey on the remote island of Iona, Columba initially crossed to Kintyre before travelling north. The artist chose The Gauldrons, a rocky bay west of Machrihanish, as the scene, and is believed to have painted the landscape en plein air. He then completed the figures and boats back in the studio. During the middle and latter part of the nineteenth century, large numbers of Scots from the Hebridean islands emigrated – many under duress – to America and Canada in the hope that they would prosper there rather than starve on their crofts. McTaggart was deeply moved by these events, and his own sister and her husband were among those to emigrate. He painted three major works, and numerous copies and variants, marking the emigrations. 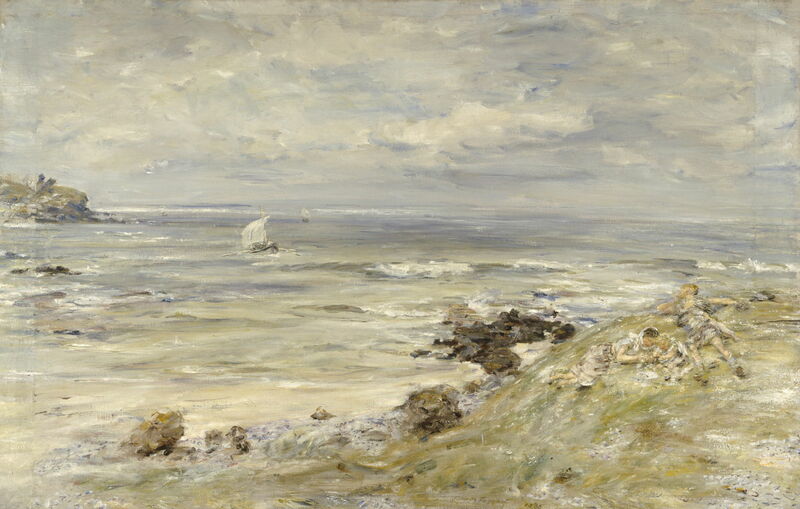 The Emigrants Leaving the Hebrides was started in 1883, when McTaggart painted the headland from which the emigrants left at Carradale, but he did not complete its details until 1889. This shows the migrants loading their few possessions into rowing boats in the foreground, then being rowed out to the waiting ship in the distance. 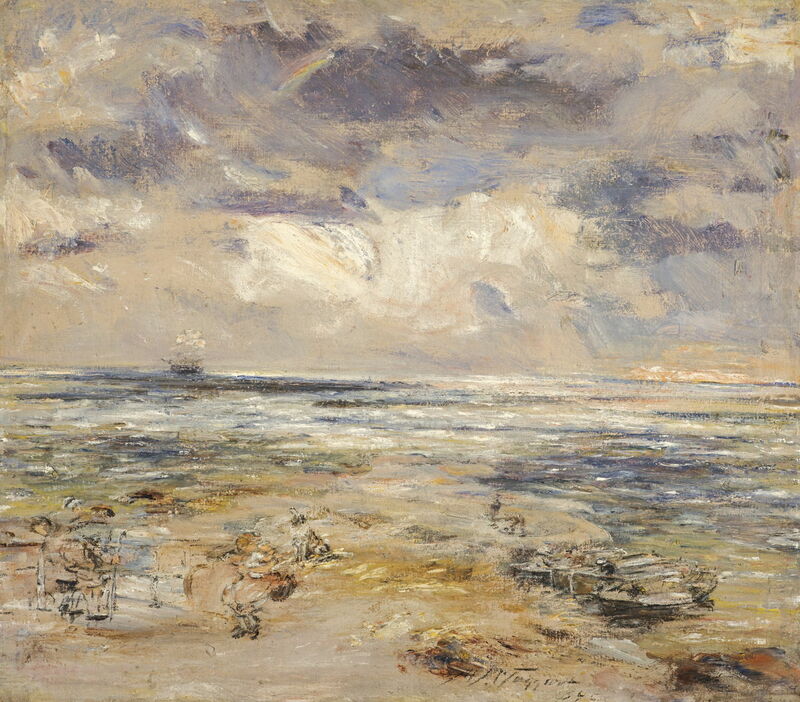 McTaggart shows several different influences here, particularly that of Constable in the sky and his scattered highlights. By this time he is likely to have seen Impressionist paintings, when they were exhibited in London in 1883, although this work shows little influence from the likes of Monet. The Sailing of the Emigrant Ship (1895) shows a later stage in the process, with the emigrants all aboard the ship which is now sailing off to cross the Atlantic. Left behind on the rocky coast are those who were too old and infirm to travel, and are now left without the support of their younger family members. McTaggart’s handling of the sky in particular is here much rougher and more vigorous, with just a glimpse of a fragment of a rainbow, symbolising the hopes of the emigrants. 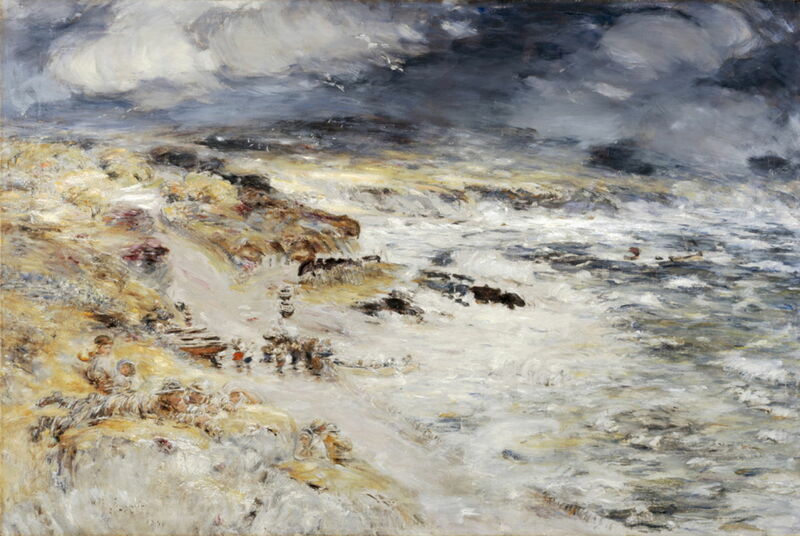 William McTaggart (1835–1910), A Westerly Gale, Machrahanish (1897), oil on canvas, 130.6 x 205.5 cm, Campbeltown Museum, Campbeltown, Scotland. The Athenaeum. A Westerly Gale, Machrahanish (1897) is another superb rendering of rough conditions in this bay on the west coast of Kintyre. 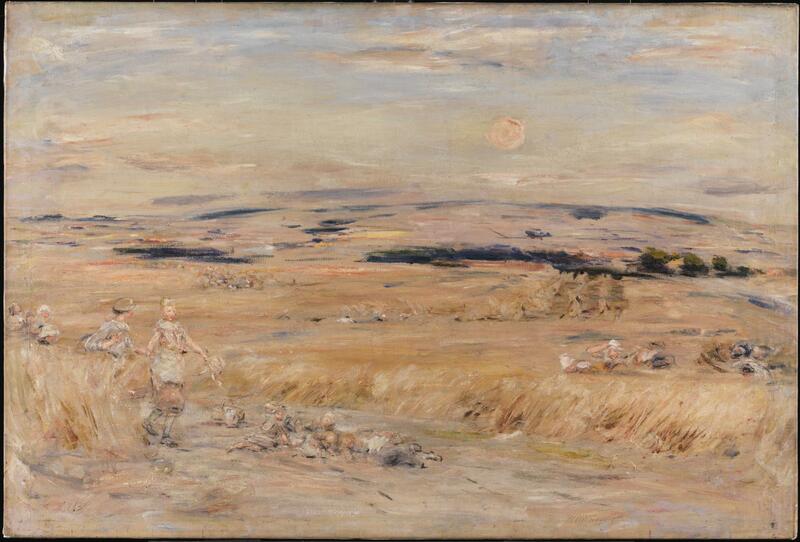 McTaggart painted many fine views inland too, such as The Harvest Moon (c 1899). This idyllic scene was based on a smaller panel which he painted en plein air near his home at Broomieknowe to the south-east of Edinburgh, where he lived from 1889. Typically for the artist, there are many figures still at work, cutting the corn, as children doze and a young couple stroll out together. But he kept returning to the coast, and continued to paint its seasons and moods, its fury and its peace. Posted in General, Life, Painting and tagged Constable, Hague School, Impressionism, Israels, landscape, McTaggart, Monet, painting, Scotland, Whistler. Bookmark the permalink.